Following the news that California allowed oil companies to inject waste into federally protected underground aquifers, state regulators are offering a new set of rules to govern the way water is safeguarded in the future. According to a report by the Associated Press, state officials permitted oil and gas companies to dispose of waste and other fluids into aquifers containing drinking and irrigation water more than 2,500 times. Significantly, 46 percent of these permits were authorized within the last four years – the same timeframe during which the Environmental Protection Agency (EPA) warned California that regulators were not sufficiently protecting underground water reserves in the drought-stricken state. On Monday, regulators offered the EPA a new plan that detailed how California would change its permit approval process. The plan also addresses how the state would confront contamination risks. Steve Bohlen of California's Division of Oil, Gas and Geothermal Resources said that 140 of the affected injection sites were actively pumping waste into aquifers holding good quality water. "It's a problem that needs our very close attention and an urgent path forward," Bohlen said to AP on Monday. Authorities have yet to uncover any instances of contamination, but experts noted that in cases where aquifers do become tainted, it could take years or decades for evidence to show up. Health concerns over oil and gas exploration have spiked in California as the state’s energy industry continues to be boosted by hydraulic fracturing, which involves injecting highly pressurized water, sand, and other chemicals into layers of rock in order to release oil deep underground. California is the third-largest oil producing state in the US, but it’s also in its fourth year of a severe drought, highlighting the need to keep its water reserves safe. Last year, California Gov. 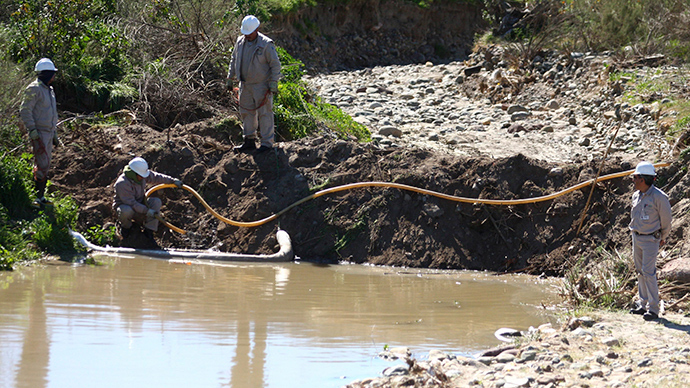 Jerry Brown declared a drought emergency as statewide efforts to conserve water increased. In October 2014, the state discovered that the oil industry injected some three billion gallons of wastewater into aquifers holding water for drinking and irrigation. Meanwhile, in July that year, seven companies were hit with cease and desist letters after 11 wastewater injection sites were shut down over contamination concerns.